It's German Measles. It's also called Rubella. Just to be confusing, Measles is also called Rubeola. The two viruses both cause fever and red rashes that start on the face and spread. The viruses, though, are different. Rubella is caused by the Rubella virus, which is the only virus in the Rubivirus genus and belongs to the family of Togaviridae. Measles is caused by the Morbillivirus from the virus family Paramyxoviridae. The viruses also cause different diseases. They are however both in the MMR vaccine which stands for M-easles, M-umps, and R-ubella (and in the MMRV vaccine which includes Varicella, or Chickenpox). As vaccine rates drop for measles, they inherently drop for rubella. Outbreaks of measles may be followed by outbreaks of rubella. Rubella causes a rash with small spots, which may be red or pink, that start on the face and spread. It causes a fever and a cough, runny nose. Many have swollen glands in the neck and head, which can last for several weeks, well after the other symptoms have gone away. These swollen lymph nodes are behind the ear (post auricular), the back of the next (posterior cervical), and back and base of the head (occipital). Many adults also have painful joints. 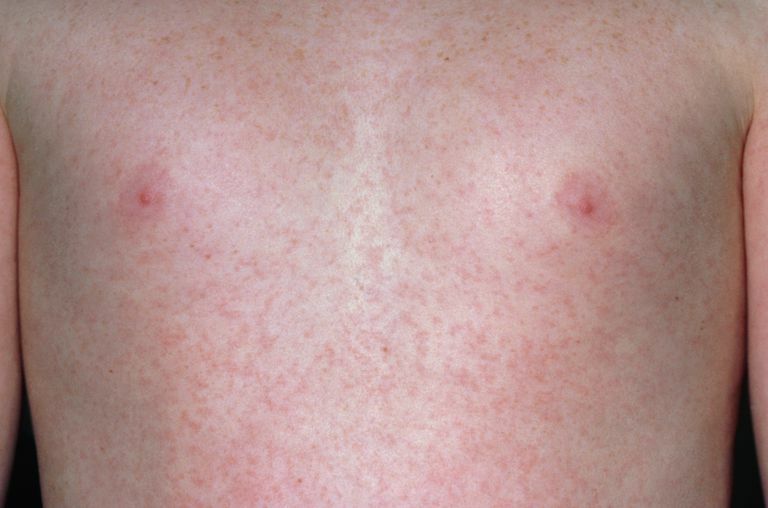 Rubella is often a milder disease than measles. Most get better in 7 to 10 days. There is no specific treatment that cures rubella. Instead, care is intended to make sure someone feels well. Although for many the illness is mild, there are some important complications that can be very serious. Rubella spreads through respiratory droplets. These can spread with a cough or sneeze or just talking and breathing. Because spread is by droplet, Rubella is not as infectious as Measles, which is airborne. Rubella can spread from one case to cause 5 to 7 new cases (Measles can cause 12-18). After exposure, it usually takes 2 to 3 weeks before symptoms develop. People are infectious before they have symptoms. Someone can spread the disease for a week before they know they are sick. Usually, people are infectious 1 week before the rash until 1 week after the rash. The infection causes fewer symptoms in those who are younger. Those who are older, particularly women, can face more challenges. Up to 70% of adult women who are infected develop painful joints from Rubella, while children rarely do. Most importantly, rubella can affect pregnancies. Unfortunately, as cases of rubella drop, those who are unvaccinated tend to first encounter rubella at an older age. This can even lead to them having a higher risk of any infections that they might have occurring during pregnancy. Rubella in the first trimester, first 20 weeks of pregnancy, can be very serious. Babies born from mothers who had rubella early in pregnancy can face a number of problems. They can have eye problems (cataracts), deafness, heart problems, and brain damage. This is called Congenital Rubella Syndrome. Rubella was eliminated in the US in 2004. In 2015, it was announced by health officials that no case originated in the Western Hemisphere. However, because infections occur worldwide, it can always be reintroduced and affect those who are not vaccinated. 4000 cases occurred in the UK as late as 1996. Each year it is thought worldwide that 100,000 are born with Congenital Rubella Syndrome. As MMR vaccination rates drop, this may mean more cases of birth defects in small babies. What Is the Usutu Virus? Chicka-what? The Chikungunya Virus - Should You Be Worried? What Is a Pathogen and How Does It Make You Sick? What Is It Like to Have Chikungunya? Why Are Some Diseases Making a Comeback?